In the City of Palm Springs, many great golf courses are open to the public at reasonable rates, Use our Palm Springs golf guide to find the best course for you! Click here for Palm Springs Golf Lodging, Private Villas with Private Pools, 1-8 bedroom Palm Springs vacation villas: home & condo rentals for golf trip lodging! Big group for your Palm Springs area golf trip? Sleep up to 12 to 20 people in one affordable villa! The Escena Golf Club, located less than 10 miles from Palm Springs, offers a challenge to golfers looking to measure their driving prowess. This 18-hole course designed by golfing legend Jack Nicklaus covers a distance if 7,211 yards with a par of 72. The course features thousands of palm trees, sloping fairways, and water and sand hazards throughout. Golfers will also find four holes measuring more than 500 yards, including the monstrous No. 1, which measures 611 yards from the championship tees. The Palm Springs region offers a variety of resorts featuring golf courses. 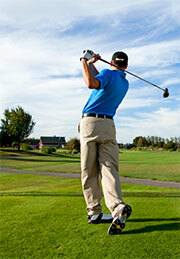 The nearest resort golfing to Palm Springs is the 18-hole Legends courses located at the Tahquitz Creek Golf Resort. The course offers vistas of snow-capped mountains, wide open fairways and stands of palm trees guarding large greens. Putting on the greens, however, represent a major challenge, as they are severely sloped. This par-71 course measures 6,775 yards and features an open, desert "links" style, conducive to walking as well as riding. In Palm Springs, players can find several courses within 20 miles that are pleasant to walk. The nearest course is the nine-hole Bel Air Greens course. This Tommy Jacobs' designed course at Bel Air Greens in Palm Springs measures 1,675 yards and is a par-32. The course is extremely flat, great for walking, and features its share of sand bunkers. The Cathedral Canyon Golf Club also offers nine-hole golf courses measuring just more than 3,000 yards each, or golfers can play all 18 holes. The course presents a flat lay-out and features water hazards on over half of the holes in each nine-hole layout. he Golf Club at Terra Lago presents 36 challenging holes (North Course and South Course) the North Course features dramatic elevation changes, stunning views, and a beautiful and challenging island green par 3 which was a featured hole during the Skins Games played at The Golf Club at Terra Lago. The view from the 7th tee box is considered one of the best in the valley, from there you have a complete panoramic view from one end of the Coachella Valley to the other. measures 7,060 yards (Rating 73.7 / slope 137) from the championship tees, but with 4 sets of tees to play from players of all skill levels can find their game. The North Course measures 5,067 yards (Rating 69.7 / slope 124) for women and the forward tee boxes eliminate many of the forced caries required from the other tee boxes. features one of the most unique and memorable holes at The Golf Club at Terra Lago. Hole # 2 is a narrow par 4 that runs along a wide canal making anything hit to the right impossible to play, as you approach the green you must cross this canal. Rather than a traditional wood bridge the designers decided to add a little flare to the experience by creating a bridge from an old rail car. This hole is affectionately known as the "Box Car" hole. Mesquite Golf Course is centrally located less than ten minutes to downtown Palm Springs. The course at Mesqiute Golf and Country Club features five lakes and many large trees lining the fairways. The mountain views of the San Jacinto Palm Springs mountain range is gorgeous from this course. Mesquite Country Club has hosted several local PGA and Golden State Tour events. Though this course is relatively short by championship standards, playing 6,400 yards from the tips, Mesquite Golf Course offers a challenging golf game with numerous water hazards. The Cathedral Canyon Golf Club at Welk Resorts Desert Oasis was designed by David Rainville, who has specialized in California golf courses and boasts one of the most spectacular courses in the Coachella Valley. Renowned golfer Billy Casper assisted Mr. Rainville in the design. Cimarron Golf Course, Palm Springs: an upscale Palm Springs golf facility featuring two championship golf course layouts, The Boulder Course (36 hole) and The Pebble Course (18 hole). Desert Willow Golf Resort is unlike any other Southern California golf vacation. You will see it in our staff, our two championship golf courses, our spectacular clubhouse, our new Palm Desert Golf Academy, our weddings and special events and of course our incredible views of the surrounding Santa Rosa Mountains. It's award-winning championship golf in One Legendary Location, on Two Unforgettable Courses. If you are visiting from out of the area and are looking for a local secret, visit Mountain Vista Golf Club atSun City Palm Desert. You can scour the valley and find courses in Cathedral City, Palm Springs, Rancho Mirage or even La Quinta but if you want to play challenging course with extremely well maintained greens at an exceptional price, look no further. 36 holes of Championship Golf, designed by golfing Legend Billy Casper, are open to the Public 7 days a week. Rentals for all occasions 2, 4, 6, 8 passengers. Great on the course or just to get around town.